Stuffed toys appeal to people of all ages, whether they are tiny tots who drag their stuffed animals everywhere they go or adults exchanging heart-bearing teddies on Valentine’s Day. Even if you feel that you have outgrown your teddy bears or other stuffed toys, you may still keep them as treasures of childhood memories. While stuffed toys and animals bring a smile to your face, they also accumulate a lot of dust and bacteria that can cause health problems – especially for the little ones who hang on to them for dear life and may bite or rub the toys against their face while playing. You have to be careful while washing these, as a washing machine can prove to be too rough on them and your little ones may not forgive you for ruining their favorite playmates. Well, there is good news for you, as we have come up with three easy-breezy methods to clean stuffed animals and toys without damaging them. While machine washing can be rough on stuffed toys, we’ve got a simple hack that can prevent damage to the toy. All you have to do is to put the toy inside a mesh laundry bag and then wash it in the machine. Make sure you remove any attachments like chains, crowns, slippers and glittery or net dresses before washing them. Toys made with foam balls instead of regular batting or with electronic equipment like a music box inside should not be washed in the washing machine or with water. Try one of the other methods for such toys. 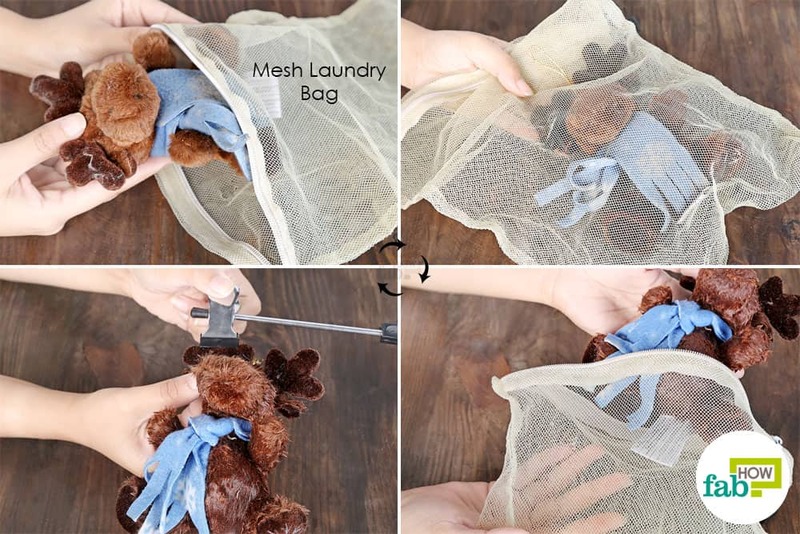 Place the stuffed toy inside a mesh laundry bag. Launder it in the washing machine. Select a cycle with warm or cool water, never hot water. Set the machine to the delicate or gentle cycle. Stuffed toys can get balled up in the normal wash cycle. After washing, remove the toy from the mesh bag and stretch it to restore its original shape. Clip it on a hanger and let it air-dry. Do not put it in the dryer, as the heat can cause the glue and fur on the stuffed toy to melt. The simplest and gentlest way to clean stuffed animals and toys without damaging them is to wash them by hand. You can use liquid dish soap to disinfect and gently clean the outer surface. You need to remove all the attachments and wash the different pieces of attire separately. Take care not to submerge any toys with electronic parts in water, as doing so will not only damage the equipment but you may also be at the receiving end of a nasty electric shock. 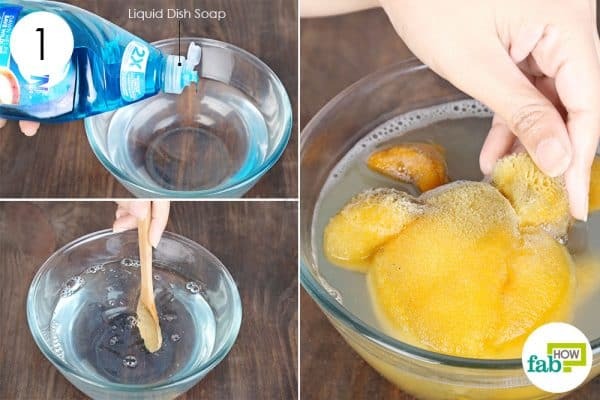 Pour some water into a large bowl and add roughly 1 teaspoon of liquid dish soap to it. Mix the soap into the water. Submerge the stuffed toy completely in the cleaning solution. Use your hands to gently scrub and wash the toy. If needed, you can use an old, soft-bristled toothbrush to scrub off more stubborn stains. Once the toy looks clean, give it a final squeeze to wring out the soapy liquid. 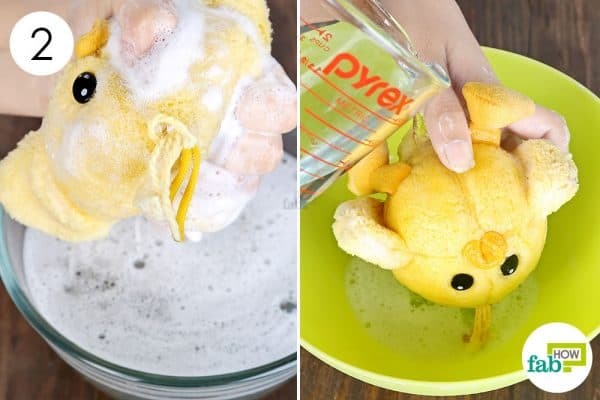 Rinse the stuffed toy with clean water to wash out the remaining suds. Wring out all the excess moisture and let it air-dry. Your stuffed toy will now look as good as new. 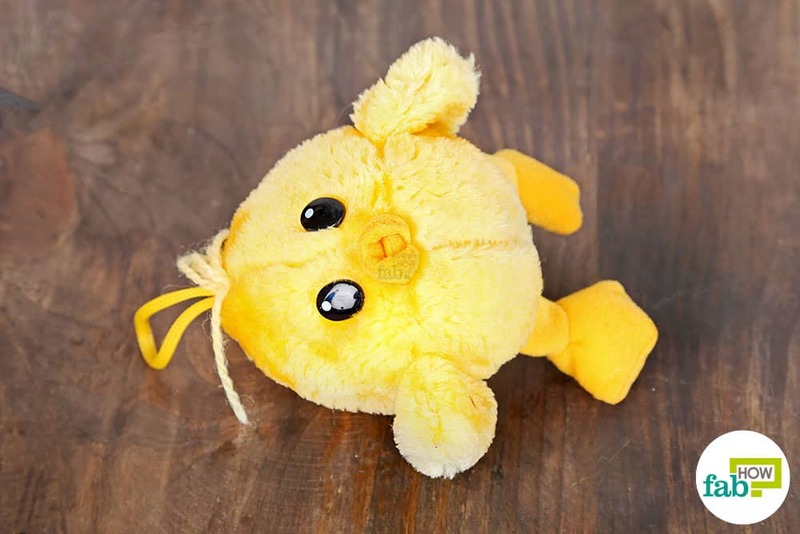 You can use either of the two dry wash methods to clean stuffed animals and toys without damaging their internal, battery-operated electronic devices. Baking soda is used in several cleaning hacks and also works as an excellent cleaning agent for your furry toys. 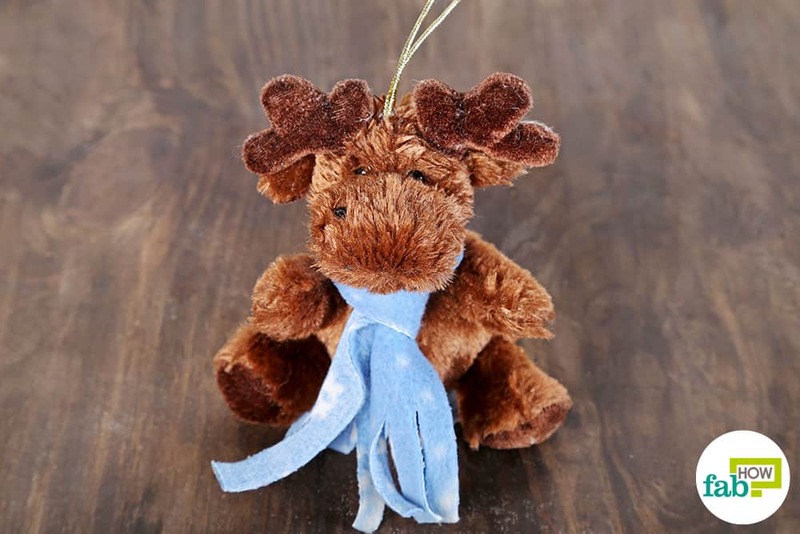 It absorbs oil and other impurities from the fur of the stuffed animals, leaving them spick-and-span with a clean fresh scent. 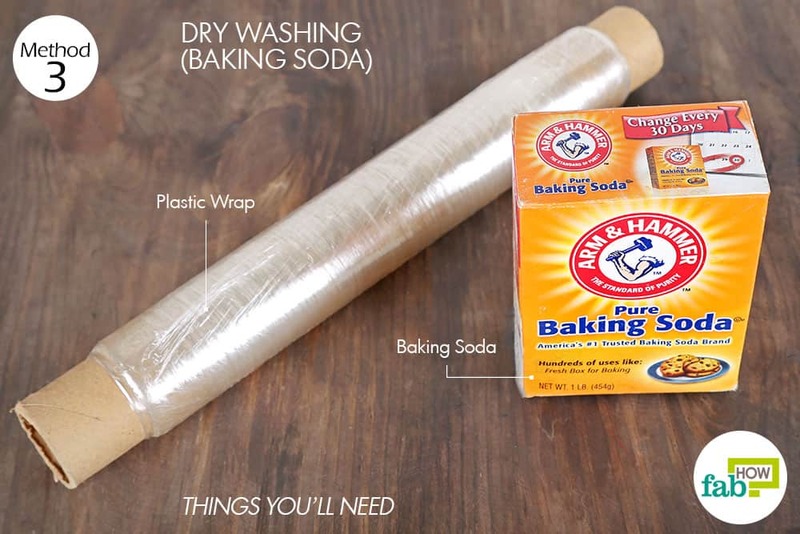 Stretch out a long length of plastic wrap. 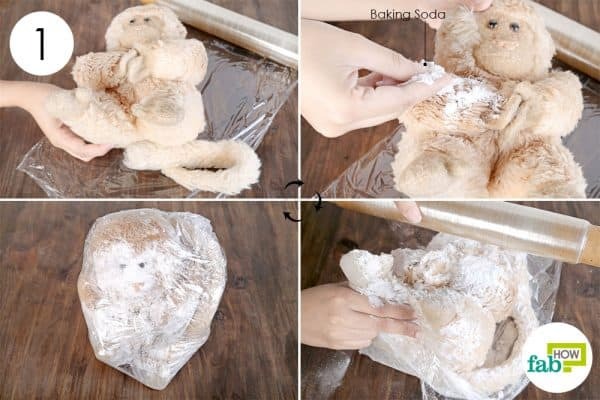 Place the stuffed animal on top of it and cover it with a light coating of baking soda. 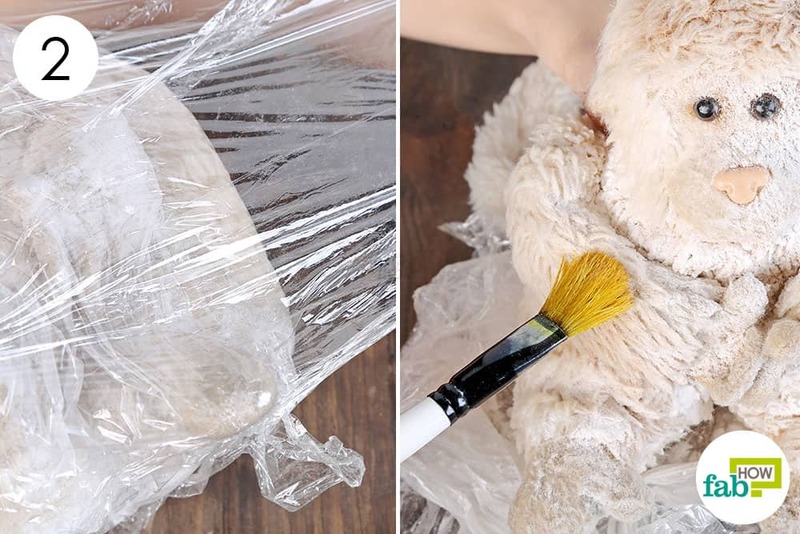 Wrap the stuffed toy completely in the plastic wrap and shake it vigorously. After shaking, let the wrapped toy sit for 15 to 20 minutes. This will give the baking soda enough time to absorb all the dirt and impurities form the fur. Then, unwrap the stuffed animal and brush off the baking soda. You can also use a vacuum cleaner with a small attachment to clean the animal. Just turn it on at a low setting. 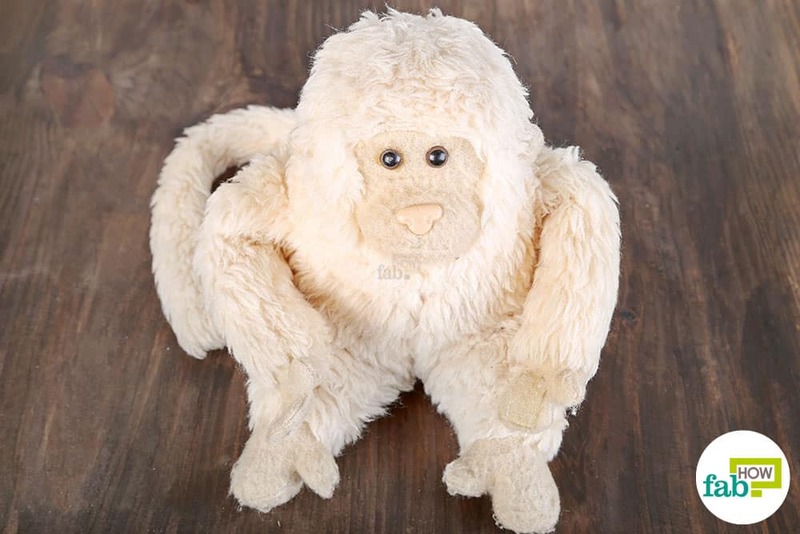 You can now give the clean and fresh-smelling stuffed animal back to your toddler. No doubt, it will become filthy again – at least now you know what to do about it. You can also use a paste of baking soda and white vinegar to thoroughly sanitize and clean the matted fur of stuffed animals, especially if you want to brighten white fur. Vinegar acts as powerful disinfectant and can be used to clean your home as well. 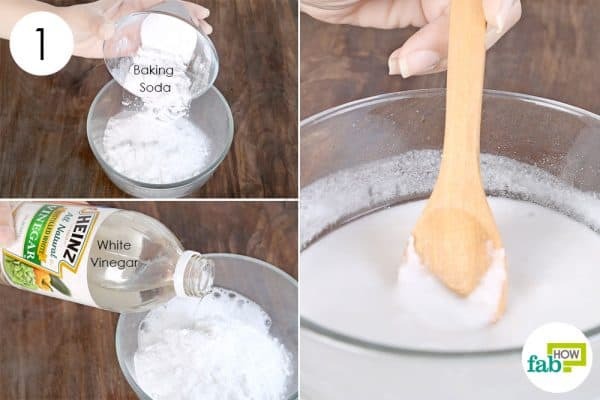 Put about ½ cup of baking soda in a bowl. Add just enough white vinegar to make a smooth mixture for cleaning. 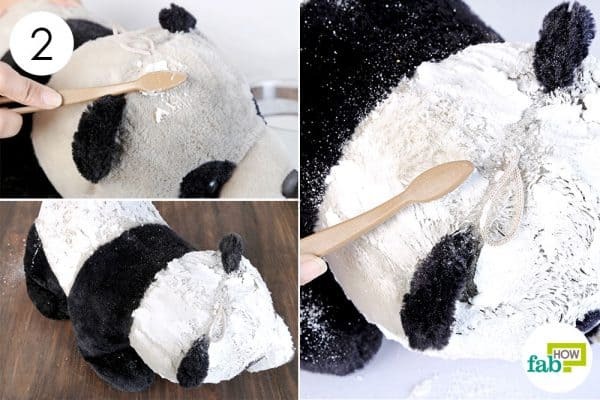 Take some of the cleaning paste on an old, soft-bristled toothbrush and use it to scrub your stuffed animal’s fur in circular motions. Work in sections, scrubbing one part clean and move on in sections until you’ve scrubbed the entire surface of the stuffed animal. You will notice as you clean that the fur feels dry, despite the use of white vinegar. This is due to the baking soda. Do not wash stuffed animals with moving joints in the washing machine. Never dry stuffed animals in the dryer. Instead, hang them out in the sun for 1 to 2 days in order to dry them completely. You can also use a hair dryer to dry your stuffed toys after washing them with water. Just take care to set the hair dryer on low heat, as high heat may damage the fur. Always read the instructions on the label to determine the best way to clean stuffed animals and toys without damaging them. Do write to us via https://www.fabhow.com/contact if you want any more cleaning tips. Thanks, this worked out great for my stuffed animals that can’t be washed. ? It motivates us to put forward more useful information for our valuable users. A soft shoe (not medium or stiff) brush works great and lifts/fluffs old matted fur as well. Thank for the tip !! Can you elaborate on the last method?? This screws up my stuffed animal so badly! It didn’t feel dry like you said at all, it was wet from the vinegar. I let it dry out then the fur was all clumpy and now I think its ruined. Do you know how to get the baking soda clumps out of the fur? Don’t worry! Your stuffed animal is not ruined. 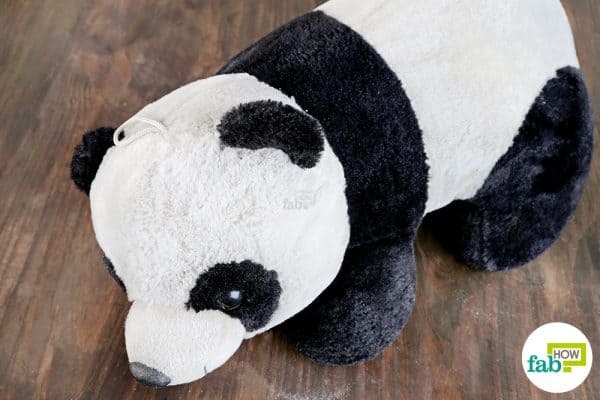 Drain out any extra vinegar if there is any and let your stuffed animal dry overnight. It may take more than one night to completely dry out, it is perfectly normal. 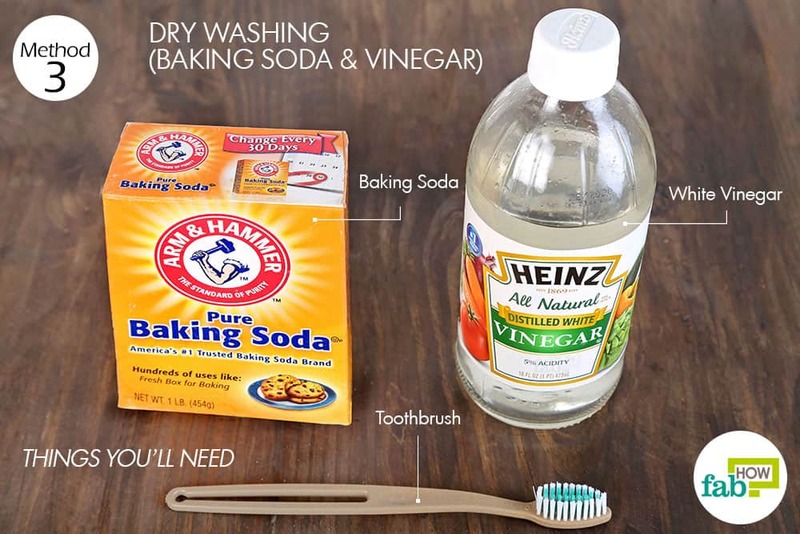 The major concern, baking soda clumps- just brush them out using a soft old toothbrush. If it is a long-haired animal, you can also use a comb to remove the clumps from the fur. I had a 7 year old who crossed the street with out looking and was hit by a car and died in 1968 I still have his teddy bear and a shaggy yellow dog I got them out of a box one day and put them on my closet shelf where I could see them ever time I open the door. After a couple of days I began to smell and a odd smell in my closet and realized it was coming from Bobby’s toys can I still clean them? You can always cherish his/her memories and we are so glad to be able to help you out. If the teddy bear is small in size you can use the dish soap method. Just soak the teddy in a dish soap solution for some time, using a soft brush remove the dirt and rinse with normal water. It may take a few washes before it reaches its original condition but we are sure it can be cleaned easily. Specifically for odor removal, you can use the baking soda method as well. Coat the toy in baking soda and wrap it with plastic wrap. Leave overnight for best results.